Announcing the Vic's Bingo Hall!! Gambling World is Proud to Present Vic's Bingo! 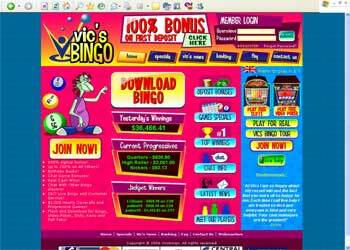 The bingo software at Vic's Bingo has both a download version and also offers a no download version of their games. The slots and video poker are also offered both ways. Like many other bingo rooms there are constantly big chat games going on. Sometimes the jackpots from some of these games are pretty big too. There are often pattern specials also, which means you can win special prizes for covering certain patterns on your bingo cards. This place has a real spirit of community also. In fact many members share their favorite recipes. They also offer a $10 free bonus for sending in your picture if you choose to, so often you can see what the other players look like as you are chatting with them. Believe me this adds a nice sense of friendliness to the games also. There are many features built in to online bingo software that are just unobtainable in a land based game. One is the auto-daub feature. What that means is that the software will automatically mark the numbers for you as they are called. This insures you will never miss a number because you were distracted chatting with a friend, or if your cell phone rings. That is pretty cool when needed. A Trend Setting Bingo Hall! Visit Crazy Vegas Bingo Today!